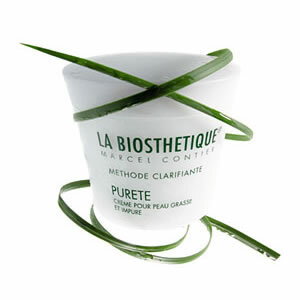 La Biosthetique Methode Clarifante Purete is a delicious daily care cream for oily, blemished skin. La Biosthetique Methode Clarifante Purete normalises the sebum production and contains lemon grass oil for an anti-inflammatory and antibacterial effect. With La Biosthetique Methode Clarifante Purete free radicals are trapped, the skin is calmed and skin irritations combated. After cleansing and tonifying, simply apply La Biosthetique Methode Clarifante Purete to the face and other affected areas using light, circular movements.